During the fall of 1839, not long after the original group of immigrants first arrived in Perry County, another group of German Lutherans were boarding a ship in Germany to join them. In fact, this new group was boarding one of the same ships that had brought a load of passengers to America in late 1838. That ship was the Johann Georg, and the date of this second departure was on this date, September 14th. Here is an artist’s rendition of that ship done by Rev. George H. Hilmer. This group of travelers was under the leadership of Rev. Karl Gruber. We have referenced this Gruber Group on several occasions on this blog, but today, we will focus on why this group did not depart Germany with the rest of the Gesellschaft in November of 1838. I must say first, though, that I do not consider myself to be an expert on this subject. I think much of what has been written on this subject is speculation, so it then follows that anything I say on the subject is speculation as well. One possibility for Rev. Gruber and his group to leave at a later date, may have been that he and the people that ended up going with him were just not ready to go. The group may have been made up of people who wanted to emigrate with the rest of the Gesellschaft, but were just not able to get all the necessary arrangements made in order to leave with the original ships in November of 1838. They may have had issues with disposing of their property and businesses in Germany. Individuals may not have amassed the required funds to make the trip. Some may have had to deal with medical issues that kept them in Germany just a little longer. One publication written has stated that Rev. Gruber came later because of “outward hindrances”. Another possibility is that Gruber himself was dealing with health issues. Zion on the Mississippi refers a little bit to this possibility and eventually says that later in 1839 that Gruber was “ready to go”. There is also some indication that Gruber had been promised some financial support for this endeavor, but the donor or donors had later changed their mind and withdrawn their investment. This would have meant that more efforts would have had to be made to raise the necessary funds. Another issue that may likely have been part of Rev. Gruber’s delay was his sometimes volatile relationship with Rev. Martin Stephan, the leader of the immigration society. There is evidence from a variety of correspondence and diaries that both Rev. Gruber and Rev. Gotthold Loeber had begun to have reservations about Rev. Stephan’s leadership during the years leading up to the departure of the immigrants. Rev. Loeber had basically been coerced by other leaders in the inner circle of leadership to apologize to Rev. Stephan for questioning his character. Pastor Gruber had the same kind of reservations about him, and he, too, eventually was pressured into begging for Pastor Stephan’s forgiveness. Gruber’s delay in leaving Germany may have had something to do with his distrust of Pastor Stephan. In retrospect, many others would later realize that these early examples of distrust of Rev. Stephan were justified. Although all indications are that Rev. Stephan’s theology was rock solid, and his influence on people was charismatic, his judgment concerning the stewardship of the Gesellschaft’s funds and the decisions he made about his personal behavior with young women eventually led to his removal and disgrace. I have never read anywhere that Rev. Gruber had heard in Germany about Rev. Stephan being expelled from the Gesellschaft. It may be that the first he heard about this event was when he arrived in Perry County on December 12th of 1839. Whatever the reasons, it was just three days after the opening of the Log Cabin College that a group of over 100 new immigrants arrived in Perry County. They must have found a group of exhausted people who were straining to survive in this primitive environment and were also still in the midst of turmoil after the shakeup of leadership in their community. Many of the members of this group ended up living in the area which is now called Uniontown, Missouri. One member of our research crew, Fred Eggers, has uncovered evidence that some efforts were made to send people here with the original immigrants to make preparations for the Gruber Group by obtaining property in the Uniontown area which would be used by many of these new arrivals. So today marks the day that the last large group of German Lutherans left Germany to settle in Perry County. Grace Lutheran Church in Uniontown remains as an active congregation that can trace its history back to the second voyage of the Johann Georg that departed Germany on this day in 1839. Sorry this post does not have much in the way of visual images, but it just didn’t lend itself to a lot of pictures. Today, I will be conducting research up in the area in St. Louis where many other members of this immigration chose to remain instead of moving to Perry County. I’ll be in the neighborhood where the two buildings in this piece of art were located. It shows the first sanctuary used by Old Trinity Lutheran Church in St. Louis, as well as the home in which one of the early leaders of the immigration who became a pastor at this church lived. His name was Rev. C.F.W. Walther. It just so happens to be the neighborhood where the St. Louis Cardinals are playing today. I plan to take a time out from my extensive research to take in a ball game. While the 1937 painting by Rev. 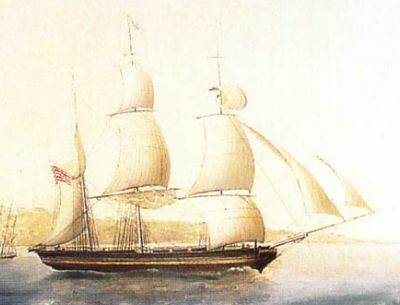 George H. Hilmer (shown above) does show a clipper ship and another in the background, there is some question as to whether it is a portrait of the Johann Georg, which was a Bark (or Barque) rather than a Clipper ship. The difference between the two sailing vessels is that a 3-mast Bark has square rigging on foremast and mainmast and the rear mast (mizzenmast) is fore-and-aft rigged. A 3-mast clipper typically had square rigging on all masts, as Rev. Hilmer’s painting shows. Both may have one or more jibs (headsails) on the front mast. The 340-ton capacity Bark Johann Georg sailed on its maiden voyage from Bremen (or Bremerhaven; “Bremen’s harbor”), Germany, to New York from May 21 to July 4, 1838. Its second voyage was from Bremen, on Nov. 3, 1838, arriving at New Orleans on Jan. 5, 1839, carrying the Saxon Lutherans. Hermann Hohorst was the captain for both voyages and two subsequent voyages from Bremen to the U.S. in 1839. One voyage was to Philadelphia in July, and one left Bremen on Oct. 2, 1839, and arrived at New Orleans on Nov. 27. It was this Bark Johann George that Dr. Carl Eduard Vehse boarded at New Orleans for the return voyage to Germany, after leaving St. Louis (and not Perry County, as portrayed in the movie, “Walther”) on Dec. 16. From what I have read, while the ensign flag of the country to which the ship was sailing may be flown, the native flag was always flown in the superior position, on an ensign staff at the ship’s stern or from a gaff rigged over the stern. A courtesy flag of the nation to which the ship was sailing might be flown from the second mast or yardarm forward of the stern, even in a higher position, but it was not considered to be in a superior position. Flying one flag above the other at the stern indicated the nation of the top flag has captured a ship of the nation of the bottom flag. The painting of the USS Chesapeake captured by HMS Shannon during the War of 1812 is an example. 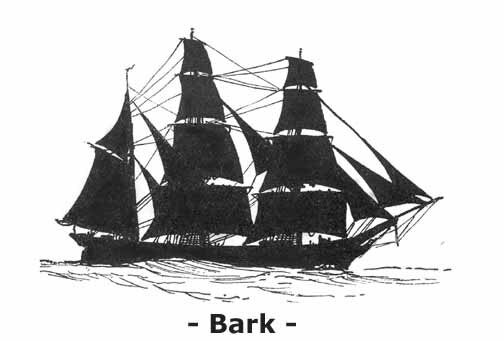 A hint on what the Johann Georg may have looked like comes an archived webpage about the bark, Johann Friedrich, built at Vegesack near Bremen and launched December 3, 1835. It has a 330 ton cargo capacity and was 29 x 8.2 x 4.9 meters.